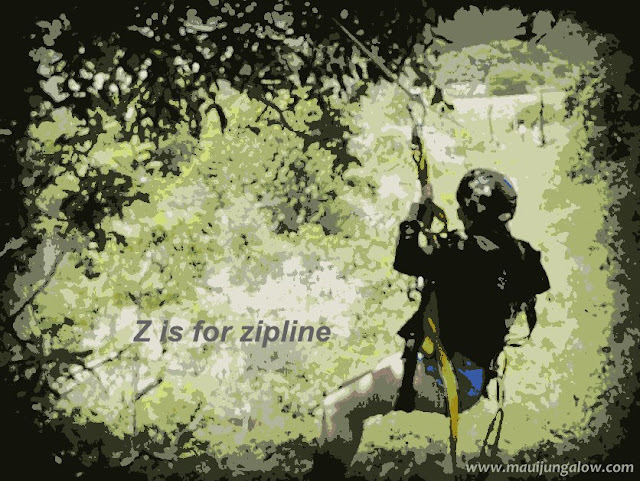 Z is for Zipline, a tremendously popular activity on Maui. This zipline is North Shore Zipline in Haiku, in my neck of the woods. It's a canopy style zipline, meaning that people climb up to a platform in the trees and zipline among the treetops to the next platform or area. Ziplines? What? A classic or stereotypical Hawaiian cultural symbol? [Shrug] I only had two choices for Z and this one has more tourist appeal! · Skyline Eco-Adventures – operates two Maui ziplines, the original on Haleakala Crater, up in Kula, on one side of the island and another, more extreme zipline on the West side of Maui. Plus they operate ziplines on the Big Island and Tennessee. They are on twitter and Facebook. · North Shore Zipline – a tree canopy style zipline, which goes from tree platform to the ground, along the forest canopy, the tops of the trees. Features active braking and some rider control. They are new on twitter and less active on Facebook. · Pi'iholo Ranch Zipline - To my knowledge, another tree canopy style zipline. Features side by side ziplines, so there’s less wait time and you can zip next to friends. Active on twitter and Facebook. · Maui Zipline Company – at the Maui Tropical Plantation. I’ve heard this one is more kid-friendly, and the lines go up to 900 feet long. Active on twitter and Facebook. · Flying Hawaiian Zipline – also starts at the Maui Tropical Plantation but one line is 3600 feet. Claims to have one of the fastest, most extreme ziplines. I could not find them on twitter, but they are quite active on Facebook. FYI: the video below has an ad and is a little over 3 minutes long. What is the best zipline? Don’t ask me… I think they all feature different things. Some are faster and scarier. Others are pricier, have longer zips, or more lines. Others are better for all age groups because they are not as extreme or physically demanding. Some ziplines let the rider have some control, others are just fun rides. Some ziplines have lots of walking and hiking and are a real work out! They are located on different parts of the island with different scenic views. Is a zipline a “must do” activity? Some people say yes, others no. You can spend hours looking at online reviews on Yelp, Trip Advisor, or talking with people. (Just a note, yesterday Yelp showed all the zipline companies on Maui and today is only showing four, with the same search criteria: zipline, Maui.) Some friends loved their zipline rides, and another friend found it a bit tame compared to kitesurfing, but she was also on one of the gentler ziplines. DH and I had a great time on ours. I have not heard of any accidents on Maui, though have heard of two accidents on the Big Island in 2011, not by any of the companies listed above. There's an element of risk, but the tendency is for the companies to be excessively safe. I've even heard visitors complain that they felt there was too much safety! Since ziplines are wildly popular, it would be foolish for the zipline companies to get careless on maintenance or safety. The path up to the platform. Do any of these ziplines have discounts or special pricing? Doesn’t everyone want to know? Ziplines usually start at $100 per person. Sometimes they have specials on twitter or Facebook, but almost never on their websites. Skyline Eco-Adventures has a special rate for Zip for the Trees, a nonprofit fundraiser in the fall. I’ve noticed that Pi’iholo Zipline has specials once in a while, around holidays. Oh, there is one other way to get a special zipline rate, and it’s tricky. In Hawaii, a common sight is the activity booth or kiosk, usually located in a high-traffic area. There will be a sign with activities like snorkeling, sunset cruise, lu’au, horse riding, hiking, ziplining, etc. with low or ridiculous prices next to each item. The catch is, to get that ridiculous rate, one has to attend a three-hour time share presentation. If you’re a couple, then both of you must attend. This is a "discount activities booth" in Kihei. They are usually located in high-traffic tourist areas and often have super low prices. There's a reason why. In effect, by trading three hours of precious vacation time, driving time, and possibly becoming the proud new owner of a one-week timeshare once a year ($10,000+), you could get a $29 zipline ride. For some, it’s worth it. For others, caveat emptor. Enough said. So far I've only been on one zipline tour with Northshore Zipline. It was extremely scary on the test zip, because it requires jumping off the platform. The first leap is the hardest. Then it got easier and less scary. I never got the hang of the active braking, using my arms and gloved hands to control the speed of the ride. Our guides were funny and entertaining, especially when two people dropped gloves and they had to jump down and get them. I took five million video clips and posted a few on youtube but never got around to editing them in any manageable way. Moreover, my zipline footage could make a sailor seasick. DH and I had a great time and my arms were sore later on. There ya go! End of the A to Z posts for 2013. Ok, well I might do a follow up post on lessons from the A-Z Challenge. Just remembered! There's a Facebook contest on best eco-tour guide. Please consider voting for Joe of Skyline Eco-Adventures. 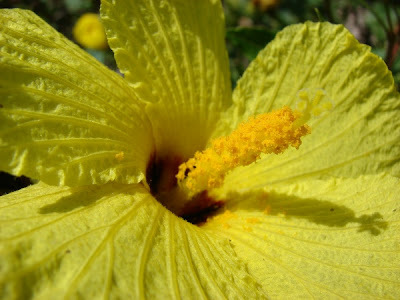 The state flower of Hawaii is a yellow hibiscus. True, but a trick question. It’s not just ANY garden variety yellow hibiscus in Hawaii. Like other Hawaiian cultural symbols in this A-Z series, there’s more to the story. Source of original photo: Forest and Kim Starr. Creative commons licensed. Image has been altered, with text added. Growing up, I thought the state flower was any hibiscus, especially the red hibiscus, which grows practically on every street in Hawaii. I was not the only one. In 1988, the state legislature made their selection of state flower very clear: Hibiscus brackenridgei, Hawaiian name ma’o hau hele, roughly pronounced like “mah oh how hell ey”. Still yet, even this week, I have visited other websites which simply state that the yellow hibiscus is the state flower. It’s just not completely true. Hawaii’s state flower is a very special native hibiscus with vivid yellow flowers that only blooms once or maybe twice a year, usually in the winter and/or spring. It’s endangered too, but is becoming cultivated in local gardens, although it is susceptible to white flies, Chinese rose beetles and excess moisture. I won’t try growing them where I live in Haiku, where plants need to have a wet suit, snorkel and mask to thrive! If you do want to grow them, this is a helpful link on cultivating and propagating the native yellow species. This native yellow hibiscus is not the only indigenous hibiscus either, as I have seen exquisite white native flowers at Fleming Arboretum. Will the real state flower of Hawaii please stand up? Source: Forest and Kim Starr. Photo is creative commons licensed. 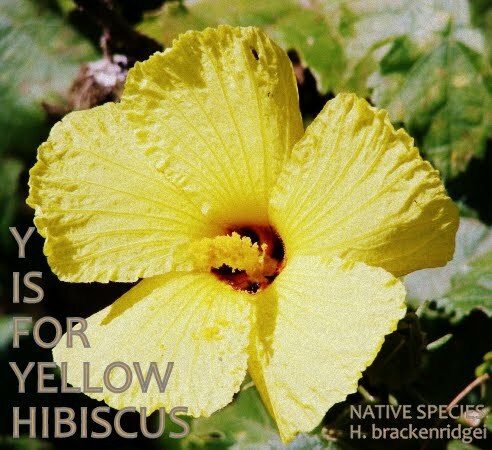 Native yellow hibiscus is not exactly a needle in a haystack, but it's hard to find in the wild. The Native Hawaiian Plant Society’s April service project was a trip to a special “exclosure” of H. breckenridgei in the wild. I haven’t heard back from them yet, but imagine a fenced in area of blooming yellow hibiscus with hungry deer and goats pacing outside looking for a way in. If NHPS goes again next April, I’m putting it on my calendar. The name of the native yellow hibiscus is also intriguing: ma’o hau hele which refers to how the plants “travel” to reproduce. The native Hawaiians, according to Maui Nui Botanical Gardens, made a blue-gray dye from the flowers, to color their tapa bark cloth (what ancient Hawaiians wore in the days before the “grass skirt”). The state flower’s bark could also be made into cordage or rope which was extremely useful at a time when nails and hammers didn’t exist. The native yellow hibiscus is blooming now at the Maui Nui Botanical Gardens, though I had to laugh at MNBG’s sense of humor, and I found out the flowers do not open up all day. What’s important about native or indigenous Hawaiian plants is that they are part of the ecosystem on the islands. Many native plants are rare or endangered, by habitat loss or other introduced species. They have important cultural traditions associated with them and when they disappear, certain genetic and cultural information is lost too. 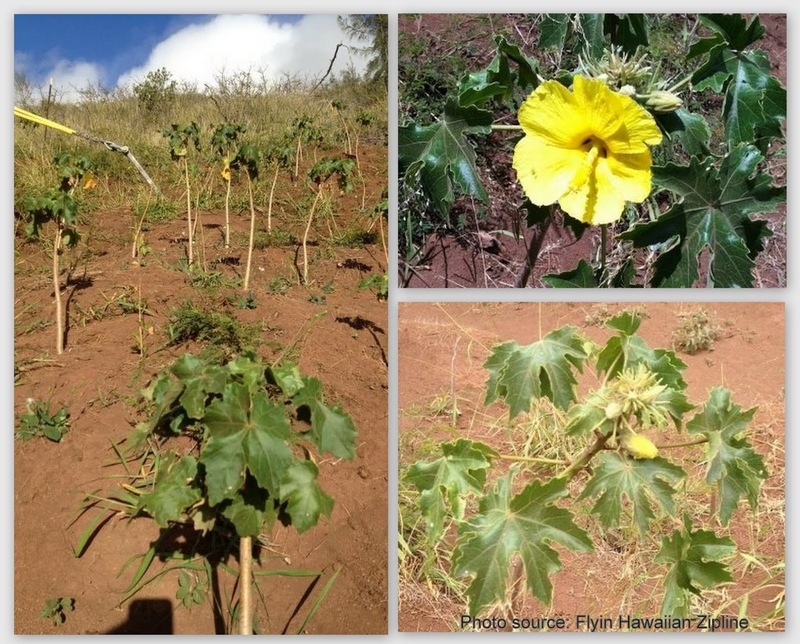 Update 6/3/13: Irene of the Native Hawaiian Plant Society provided a useful tip to figure out whether a yellow hibiscus is native or not. "Non-native yellow have oblong leaves, natives the maple-shaped leaves. BTW - Costco has planted a bunch of them around the gas station and some of them were flowering [in May]." Maui Nui Botanical Gardens – many native Hawaiian plants in this garden, with volunteer opportunities every Wednesday morning. They organize some great local events like a “Hawaiian style” Earth Day and native plant sales. Active and responsive on Facebook. D.T. Fleming Arboretum – a fabulous native plant arboretum tucked away in Keokea (past Kula). Out of the way, with beautiful scenic views and plants. Once a month service project and occasional tours. Native Hawaiian Plant Society – a group that educates people about native plants, often during field trips and community work projects. Has a Facebook page. East Maui Watershed Partnership – dedicated to protecting Maui’s watershed. Offers educational hikes into rare native habitats. Also has a Facebook and twitter account. West Maui Watershed Partnership – like EMWP, but on the other side of Maui. Hawaiian Islands Land Trust – dedicated to conserving land throughout the state of Hawaii. Many volunteer opportunities, especially on Friday mornings. Active on Facebook and Twitter. Maui Forest Bird Recovery Project - research and conservation of native Hawaiian bird species and ecosystems, with volunteer projects. Active on Facebook. Leeward Haleakala Watershed Restoration Partnership - Usually there is a once a month all-day service project to restore the Auwahi district on the slopes of Haleakala Crater. Has a Facebook page. Friends of Ahihi Kinau - service projects to restore the nature reserve on a lava flow in South Maui, including marine and historical areas. More volunteer and restoration projects can be found at Volunteer on Vacation's website. Preserve Hawaii. Volunteer opportunities ALL OVER HAWAII, not just Maui. On Facebook and Twitter. Hawaiian Islands Land Trust – dedicated to conserving land throughout the state of Hawaii. Many volunteer opportunities. Active on Facebook and Twitter. The Nature Conservancy of Hawaii. Most of their hikes/volunteer work seems to happen on the island of Moloka'i. On Facebook and Twitter. which is involved in restoration efforts on zipline land. These are all fairly young hibiscus plants. I love that these photos show the leaves and habitat of the native hibiscus. I've collaged some of their FB photos together. Mahalo for their conservation efforts! Shannon Wianecki who writes fascinating articles on Hawaii and provided this excellent link on native hibiscus and photo sources by the Starrs. Follow her on twitter at @swianecki. Maui Nui Botanical Gardens – a botanical resource of native plants on Maui, which I have been wanting to blog more about. Feel free to like them on Facebook – they consistently post a lot of plant photos and info. Forest and Kim Starr who have many great photos of indigenous Hawaiian plants, that are creative commons licensed. Flyin Hawaiian Zipline for their photos above. Surprisingly I thought this would be the easiest A-Z post to do, and it turned into one of the more complex. Yellow hibiscus… not as simple as it looked. Wha-ack-kee-kee, with a twang on the first syllable. That’s how Waikiki is often pronounced, even though locals will say, “Why-kee-kee.” Waikiki is one of the few places that most people outside of Hawaii have heard of. It’s always been a symbolic place in Hawaii tourism, and to my knowledge, the first place in the islands to be developed into a resort area. Ahem, this post gets a bit steamy... and may not be appropriate for all readers. I have altered this image and added text. Notice Diamond Head from the M post in the background. Growing up on Oahu, I hardly ever ventured into Waikiki. The local attitude was that Waikiki was where all the tourists were kept, mostly for their own safety and well-being. There were well-defined areas for residents and tourists. While tourists could venture outside of Waikiki, no resident in his or her right mind would go into Waikiki to hang out. Waikiki was a place to get hotel jobs like cleaning and valet parking. One had to have a reason to go to Waikiki. 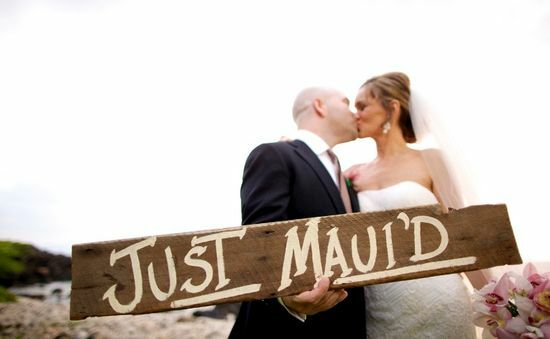 And years later, I met my husband, who had an entirely different take on Waikiki. To him, Waikiki was heaven on earth for single men. It was a place where married women took off their wedding rings. A place where a man could flash an inviting smile to a woman on the beach and she’d say, “Your place or mine?” If she said, “Buzz off,” then the next woman would smile back. If you couldn’t get laid in Waikiki, you couldn’t get laid anywhere. It was a place where the beach boys really existed. They sauntered up and down the sands of Waikiki, surfed and showed off their beautiful tans, and rubbed coconut oil on the ladies. Holy smokes. Of course, this was all during the 70s before AIDS ever appeared on the scene. Still yet, DH thinks Waikiki is a dangerous (sic) place for a man. All those hungry women. In other words, paradise. All through my early years, I’ve thought of Waikiki as a tourist trap, with ticky tacky souvenirs, plastic flower leis, sanitized hula shows, Don Ho, throngs of Japanese tourists, and overpriced restaurants. To DH, it was a continuation of the free love of the 60s. I could doubt these stories of Waikiki, but I’ve seen too many pictures from DH’s wilder days. Ah, here is where I am honoring the fiery lady who was not mentioned in the P post. Her name is Madam Pele and she is the volcano goddess of Hawaii. At least she’s not giving me the "stink eye” anymore – stink eye is the local term for a dirty look. Original source from Wikipedia Commons: a lava vent from the Volcanoes National Park. Photo by the USGS , cropped, then text added. Of course Hawaii has a volcano goddess! Doesn’t every country have a volcano goddess? No? Well, why not? Oh, you don’t have volcanoes where you live? I see.. The volcano is a major force of nature in Hawaii, not just a cliché symbol of Hawaii. Having said that, I haven’t seen any vintage Hawaii tourist posters of big volcanoes, but maybe they’re around. And there are no Hawaiian tales or reference that I’ve heard about of virgins being sacrificed to the volcano. It’s Hollywood’s poetic license. 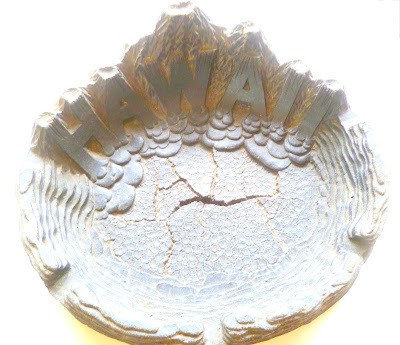 Kitschy Hawaii volcano ashtray souvenir. 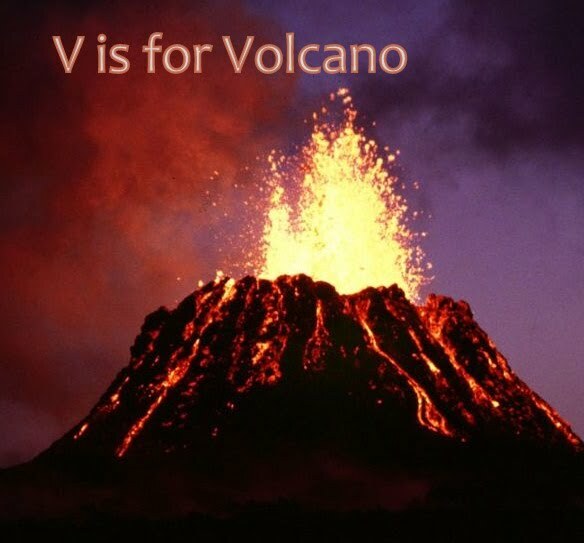 Hawaii’s volcanoes are shield volcanoes – they have a gentle slope, not a sharply angled cone. These volcanoes under the ocean spurted up lava that developed into mountains that eventually reached the ocean’s surface, kept growing, and became islands. The islands in the northwest of the Hawaiian island chain are older and more eroded by time.. those volcanoes have become craters or hills, those older islands have more coral reefs, white sand beaches, and less or no black sand beaches. The Big Island of Hawaii hosts two active volcanoes, Kilauea and Mauna Loa, and the landscape looks rocky and black in many places. Maui, where I live, is a younger island. The last volcanic eruption occurred around 1790, but theoretically Haleakala, the name of the mountain and volcano, could erupt again. Lava is a real threat in certain places on the Big Island. However, it's rare to hear of anyone dying in a lava flow or volcanic eruption. The lava tends to move very slowly. Even when it's "explosive," that's in areas far away from people. However, I did visit the beautiful black sand beach of Kalapana on a school trip, and years later, it was overrun with lava. Lava rock - can be reddish or gray. It's not always black. 1. Don’t take lava home. Leave lava rocks in Hawaii. It’s considered bad luck to take Pele’s rocks. Every year, thousands of pounds of lava rock are mailed back to the Big Island from tourists who experienced “bad luck” from taking lava home. 2. If you see a solitary woman hitchhiker on the Big Island, give her a ride. It could be Madam Pele in disguise. 3. If you are visiting the volcano, leave Pele an offering. Common gifts include leis and food. I’ve also heard she likes Jack Daniels and other hard liquor. Found a wonderful post by Saturdays with Maggy on her volcano escape backpacking adventure. Maggy recommended a New Year's Lava hike from Thrustacline, a Big Island geologist. If you're hankering for the latest lava pictures and views of the volcano, try Hawaiian Lava Daily. Lava related posts by Damon Tucker. 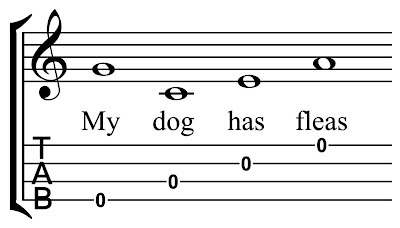 That’s the classic refrain used to test whether an ukulele is in tune. Ukulele, by the way, kinda sounds like “oooh-coo-lay-lay” with fairly equal emphasis on all the syllables. 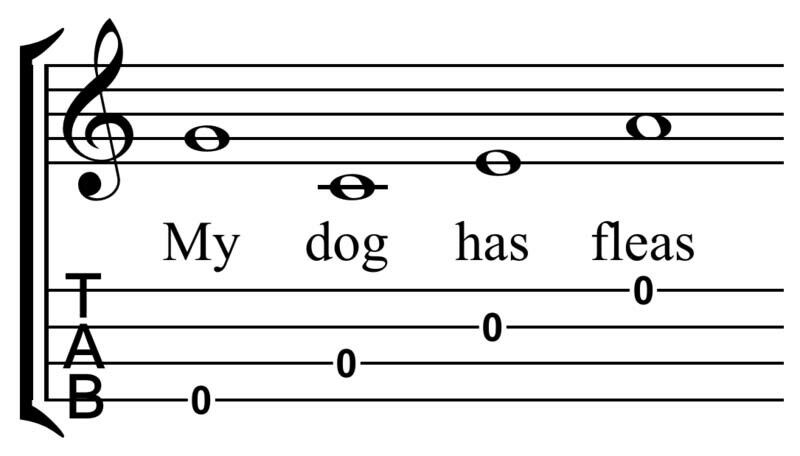 You can watch this video on youtube with two children tuning their ukulele to "My dog has fleas." Why fleas? 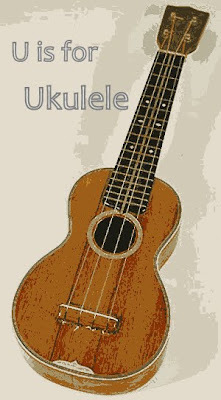 Well, the ukulele got its name from the plucking of the strings that looked like fleas jumping. A very practical and descriptive name for an instrument associated with the romance and culture of Hawaii. Interestingly enough, the Portuguese immigrants brought the instrument to Hawaii, where it was dubbed its new name and popularized in the royal court. As an aside, I wonder if the Galego village that I've been following on twitter plays instruments similar to the ukulele. The ukulele is the instrument taught in public schools all over Hawaii. I was tormented by my inability to play the ukulele, but through many years of therapy, can now talk about this publicly. There are even support groups for people who couldn't play the ukulele. ;) wink! GRIN! However, there are ukulele virtuosos, musicians who have made the ukulele do magical things. One of the best known ukulele players in the world is Jake Shimabukuro from Hawaii. I think you'll agree. This TED video is 7 minutes long, mind you, but well worth watching if you have the time, and you don't have to watch all the advertising at the end. 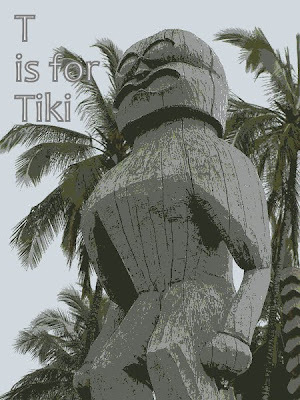 Original image: Tiki image on Wikipedia Commons, by Jason Wehmhoener. This is a larger than life tiki at a heiau or sanctuary on the Big Island of Hawaii. I have adapted or remixed the original image. Tiki… that strange, almost classically kitschy Hawaiian souvenir that Uncle Bill brought home from his trip to Hawaii. It has funny eyes and a big open or clenched jaw, almost menacing but you can’t quite take it seriously. Tikis are carved figurines, and are associated with various Polynesian creation myths. But to most people, they are stereotypical souvenirs one can buy from a souvenir stand or an ABC store. Still yet, they are a symbol associated with Hawaii, even though the word tiki isn’t even Hawaiian. The letter T isn’t even in the Hawaiian alphabet! But the Hawaiians had their version of tiki sculptures, some of which are quite large. Tiki souvenir stand at Maui Tropical Plantation. As for smaller tikis, you can buy them all day long in Hawaii. The odd thing is, a lot of tikis sold in Hawaii are not made in Hawaii. I have a pet peeve about buying souvenirs that say Hawaii and are made on the other side of the world. So please, if you buy a tiki to sit next to the tiki from Uncle Bill, make it one that’s made in Hawaii. Ask the seller, although sometimes, ewww, the sellers don’t tell the truth, or buy it from someone who’s making it on the spot. A real tiki maker at work at Maui Tropical Plantation.